The idea for this quest, I have to be honest, was not just to write about soil. I could have done that sitting at home with reference books and Skype. But I wanted to directly experience, and to travel, and in so doing tell the stories of those I met along the way. They would be stories about people and the soil. All the people would in some way be working to restore the soil in situations of drought, or plenty. Whatever the conditions they would be adjusting how they used animals to help the soil stay alive with improved grasslands, microbes and fungi, and to sequester carbon as part of that process. But sometimes you stumble across something you did not expect. The discovery of someone who is doing more than just transform the soil, but also profoundly changing the social relations around it, was not something I had bargained for. (Even though the theory of Holistic Management should have prepared me for its practice). But then Hendrik O'Neill is no ordinary carbon farmer. His story is compelling in its drama. He and his team are putting into practice, via managing the land, a new paradigm for social change. We're talking here about resilience, which overcomes trauma and loss, and keeps moving on. 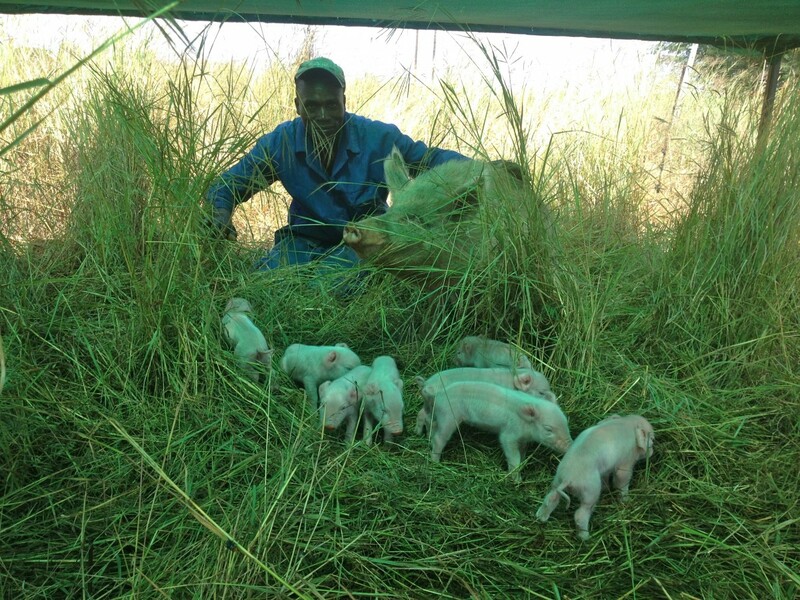 It culminates with pigs and chickens, and outstanding and rapid outcomes for the soil using Holistic Management. Its also about an evolving shift of the paternalistic relationship between the boss and his workers, to one based on openness (including finances), sharing, and learning from each other. Its quite possible, too, that without the back-story all this would not have happened. Oh yes, and another thing ....Hendrik and his team are creating a way to provide a much needed source of protein in poor communities, looking to train others wanting to use their approach. The vision is to create the space for a psychological shift in mentality, from one in which subordination to the 'chief' recreates itself within worker/employer relations, with racial divisions superimposed, to one in which Hendrik provides opportunity for his team to take responsibility and grow, where before there was none. This then is a tale from riches to rags, of inspired solutions with backs to the wall, that could become a source of hope in a country that feels stuck and ready to burn. We're talking here of South Africa. My entry into South Africa was almost as dramatic as my exit. Just over the border from Botswana, in an overland safari truck with 16 others, we were stopped by armed 'policemen' demanding to see the truck's papers. The cosiness of Botswana, with gentle jokes about my Britishness (their first Chief/President married a Scot) was rapidly replaced by fear and apprehension. With the papers all in order, there was a point at which we all wondered how our tour leader and driver were going to get us all out of this, without the possibly fake policemen losing face. Some gall taking us on, having just come through customs, and an indication of what they thought they could get away with. This was Limpopo Province, one of the most corrupt in South Africa. Then it was all over and we were on our way, only to pass some minutes later thick black smoke, as gesticulating black South Africans jumped up and down around burning tyres along the road side. Less than two weeks later I left Cape Town for my flight to Jo'berg, and my connecting flight to Sydney, shaking with relief, as my alarmingly chilled host dropped me at the kerbside with only 40 minutes to check in and board. No time to pack my sleeping bag, after failing to post it home because of another electricity outage that is a daily reality in South Africa now. I was rushed through security, about to miss my plane, with the prospect of having to find a way to process a pop-up visa for Australia in transit at Jo'berg. We eventually sat on the tarmac for an hour and a half before take-off. All the more time then to talk to the black female ex politician sitting next to me, turned dress designer, who commutes to China. Opening up to my questions, she filled me in on how the level of corruption in her ruling party had led to her leaving politics. Her children were 'born free'. How did they understand her apartheid childhood, I asked? My guess was right. Under apartheid her mother worked as a domestic/nanny for a white family, whilst she was brought up by her grandmother in a distant township. I can't talk about it, she replied, because they just don't know how to understand it could possibly have happened. Back to pigs (and the chicks introduced after my my visit) and their pivotal role in healing not just the land, but also the past. Hendrik O'Neill used to be a big man as well as a big character. He's still a big character, but its mostly his resilience that comes through in the face of more losses and trauma from political thuggery, than most of us can conceive of. He also happens to be an early adopter of Holistic Management, having followed Allan Savory's ideas in the eighties in Zimbabwe. At some points he was moving his cattle every thirty minutes, sometimes every fifteen! With 200 workers on his 11,000 hectare farm that was perfectly doable. Hendrik collected me from my motel in his borrowed pick-up for the 70 mile drive back to his rented property. Having only been in South Africa for six months, he was not in familiar territory when it came to finding his way. What mattered more was having the opportunity to share his discoveries of what pigs could do to transform the soil. And, as important, how he and his five Zimbabwean workers, had together learnt from scratch how to look after their new charges, rescued from cages and now given freedom to wallow, root and nest. He clearly loved them. So did his team, after initial trepidation, because all they knew about was cattle. His journey to 50 acres of bare and denuded rented land in Limpopo Province, South Africa, started with the trauma of losing the family farm in Zimbabwe and some of the businesses connected to it. It was shared with his brother, and in the family for 100 years. It was taken by landless urban guerillas in the upheaval created by Mugabe in the early 2,000s. Alongside the 6,000 head of cattle, they had just invested in an abattoir, and they also owned a stock feed plant, butcheries, a game lodge and a restaurant for tourists. Hendrik's brother and family were barricaded in the house, surrounded by primed firewood, and Hendrik was made to fetch money from the bank to pay the guerrillas. He describes the biggest heartbreak as being forced to pay back the loan on the abattoir. It is now in the hands of a government minister. The family home became a police station. Selling cattle to pay the guerillas' demands was not a viable option because other white farmers were raising money for the same reason. Hendrik's workers were beaten severely, and he and his brother were given 24 hours to leave, with no option of return. A 100 mile trek over four months in the bush with 2,000 cattle, to try to save them, resulted in the death of 1,000 cattle, and sympathetic black farmers who helped them along the way were targeted and beaten. 15 years later, farmers have still received no compensation for their land, their work in developing it, nor for any of the costs of improvements. Hendrik explains: 'The real tragedy of the way the land reform program was carried out in Zimbabwe, was the effect it had on the welfare of poor people (both black and white), and on their families. The rich were generally unaffected and indeed the black middle-class, politicians and thugs benefited greatly. The families of those who did not have the means to 'make a plan' were ripped asunder - scattering to all corners of the globe. Fear and the need to look for opportunities far from the centre of destruction drove this mass migration, leaving in its wake, thousands of people unable to provide for their families, men with 'their balls cut-off', many unable to adapt to change, mired in bitterness and despair. Many farm labourers became 'part of the families' of the whites who owned or managed farms. Though it was a patriarchal system and frowned upon today it was a reality. The white 'boss' of the farm, replaced the tribal chiefs and became the new 'fathers' of the laborers. Though there was very little social integration, there was inter-dependency. These relationships often spanned many generations, through good years and lean, from when the very early settlers first started to arrive in the late 1890's to this present day.' It is with this conditioning that Hendrik saw an opportunity to change things, when there was nothing to loose and everything to gain. Other attempts to make money without the land succeeded, until Mugabe intervened again. Eventually a sympathetic cousin offered to share a lease on a neighbouring property in South Africa. Rearing cows to sell on to Zimbabwe did not work, as there was no-one there who could afford to buy. The only option on such a small property was to try something completely new, which did not cost much to set up, and that was pigs. Rescued ones. From cages to freedom. And in so doing the land changed from brown to green. 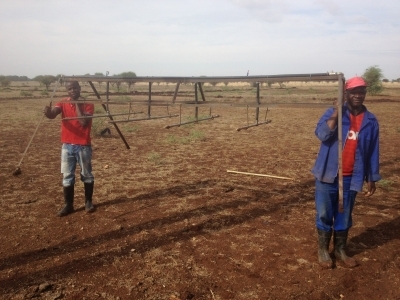 The team spent a lot of time observing, before coming up with equipment that provided water, showers and shelter for the pigs, to give shade and space to nest. The showers cooled them down, and created mud to wallow in. Moving from paddock to paddock was helped by funneled gates, and electric fences. Water outlets are also moved every two days to soil that needs improving. Supplemental feed was provided by cracked unfertilised raw eggs from a local hatchery. This was the point at which I visited. 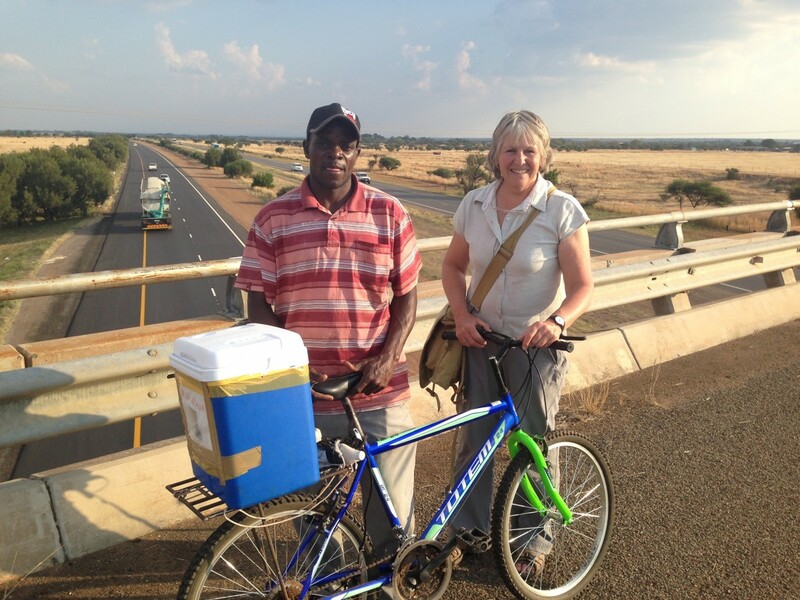 The Zimbawean workers lived and learned with Hendrik, and took the initiative to sell the pork by bicycle to the local population, as and when pigs were slaughtered and butchered off the farm. Meat for themselves was a rarity, as I discovered when I wanted to thank one of them for laundering my clothes post overland safari. I bought them meat, as it was something they rarely had the chance to eat. Whatever they cooked and ate, so did Hendrik. Maize meal was the staple for all of them. Developments post my visit have been dizzyingly fast. Hendrik's 'partneurship' with his fellow workers has involved them in introducing chickens. They were inspired to do so by the large flocks of birds following the pigs. 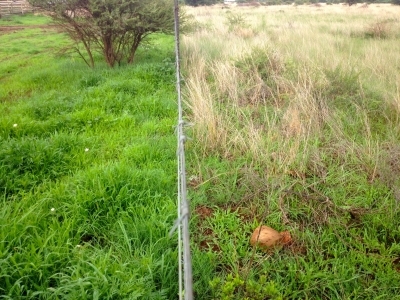 The chickens live above the pigs, coming down to forage during the day, and protected from predators by their squads of increasingly friendly pigs. A future ideal ratio of 10-12 birds per pig is envisaged, and there are 900 birds now. Visits and advice have come from two experts in chickens, David Schafer from the US, and Gift Ngundu from Zimbabwe. A small scale model is being reproduced at Dimbangombe, the Africa Centre for Holistic Management, and research has been started to look at a commercial venture on Gift's home patch in Bulawayo. 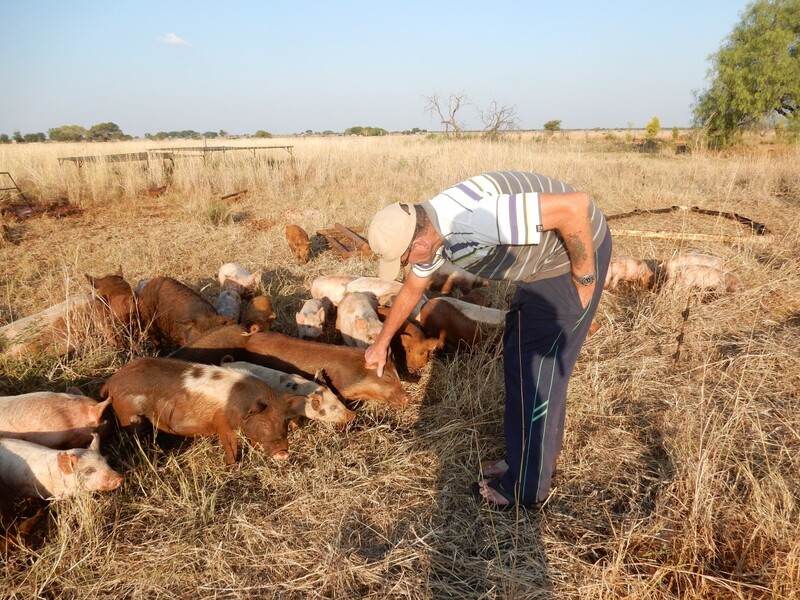 Hendrik was forced to move from his 11,000 hectare farm, eventually landing up on 20 rented hectares of denuded soil in another country, by circumstances beyond his control. Would he have come up with his inspired solution (see Ricardo Semler for similar views) for business partneurship if his good fortune to have land and a comfortable life-style had been left alone? Probably not. But that is no reason to approve of the thuggery (and murders) that he and thousands of other white farmers and some of their black workers were exposed to in 2,000, and the years that followed. But putting that aside, there is no harm in seeing a positive gain. If Hendrik's team's model of Holistically Managed pigs and chickens is groundbreaking enough to be copied internationally, so too is their working experiment to ditch paternalism and embrace a more dynamic model of openness and sharing in work and business. 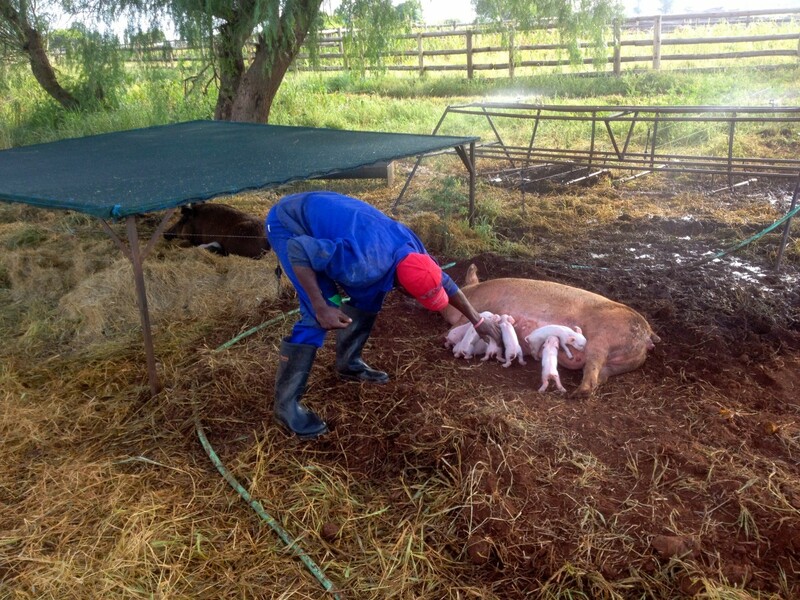 I feel privileged that I was there in the very beginning of this experiment in animal husbandry and in regenerative soil. Hendrik's courage in the face of adversity is matched by his vision, and underpinned by his past experience in changing the land. And now he has a team that is with him all the way. Will South Africa learn something from this experiment in new ways of sharing responsibility and initiative at work? Or will it stand by as others move on? Time will tell. But one thing is for sure. There is no going back now. Hendrik has shown us that its not just about changing the land. Its also about changing ourselves.